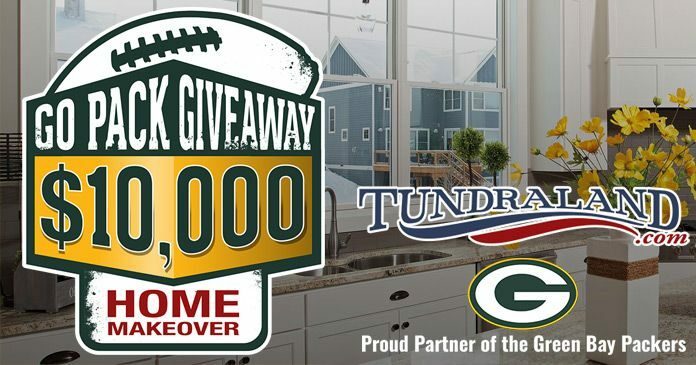 Tundraland Home Improvements, proud partner of the Green Bay Packers, brings you the Go Pack Giveaway 2017. Register now at www.gopackgiveaway.com and you could win $10,000 toward a home makeover (cost of labor and material included). The Go Pack Giveaway 2017 is open to persons who are 21 years of age or older at the time of entering this promotion and own their own home that is located in the state of Wisconsin. The Sweepstakes runs between September 28, 2017 and January 15, 2018. In order to enter the 2017 Go Pack Giveaway, entrants may visit www.gopackgiveaway.com during the Promotion Period and complete the entry form as directed. No more than one entry per household per prize period is allowed. The Grand Prize winner will be determined from a random drawing of all eligible entries received by Sponsor. The Grand Prize winner will be notified by e-mail or by telephone within three business days of the drawing in which the Grand Prize winner is selected. The Grand Prize winner will receive $10,000 toward a bath conversion, walk-in tub conversion, shower conversion, window replacement or deck system. The $10,000 includes the cost of labor and material. For a prize winners’ list, mail a self-addressed, stamped envelope within thirty (30) days following a prize period, including a request for the prize winners’ name(s), to “2017 Go Pack Giveaway” at N2277 West Frontage Road, Kaukauna, WI 54130. Tundraland did our Windows this Summer, And we would be Thrilled for you to Remodel our Bathrooms.. I'd really appreciate a home makeover. Count me in!! !